Pest description and damage Lace bugs are tiny true bugs which cause significant feeding damage to broadleaf evergreens including andromeda, laurel, pyracantha, and rhododendron. Adult insects are whitish-tan and approximately 0.13 inch long with lacy-looking wings. Nymphs grow to about 0.13 inch and are spiny. Leafhopper damage is similar but lacks the tar spots. The insects use piercing-sucking mouthparts to feed on individual cells, so the upper leaf surface is yellow and stippled. The underside of leaves is covered with dark varnish-like "tar" spots. Infestations are more severe on plants in the sun. Damage is usually apparent by early to mid-July. 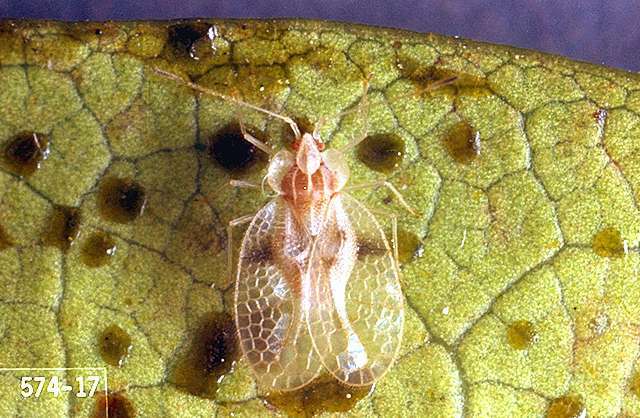 While almost never fatal, repeated infestations of rhododendron lace bugs may result in yellowed, sickly plants. Identification is based on the dark markings on the thorax and wings. Biology and life history Eggs overwinter in crusty brown patches along the midribs of leaves. 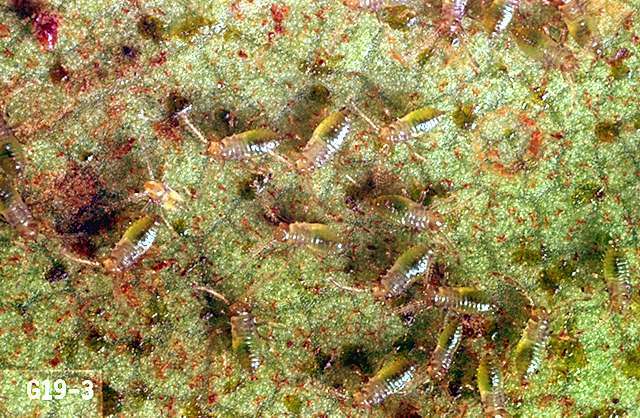 These hatch into spiny nymphs which begin to feed on the undersides of leaves. The lacey winged adults may be present through late summer and fall. There are several species attacking ornamentals and these may have different life cycles. The pattern on the wing can be diagnostic, as well as spines on the larvae. There is probably one generation a year in Oregon. 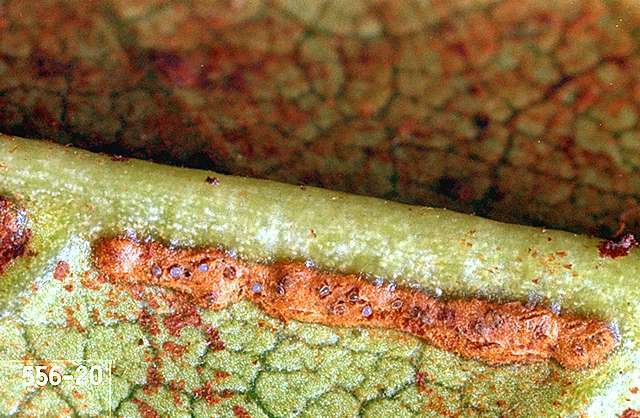 Pest monitoring In winter, look for crusty brown patches of eggs along the midrib. This will provide some early warning regarding the numbers likely to hatch in the spring. Watch for the appearance of first instar nymphs, the most vulnerable stage if control is needed. Maintain plant health by providing proper water and nutrition. Stressed plants are more susceptible to insect damage. Grow azaleas in shady areas to minimize damage. 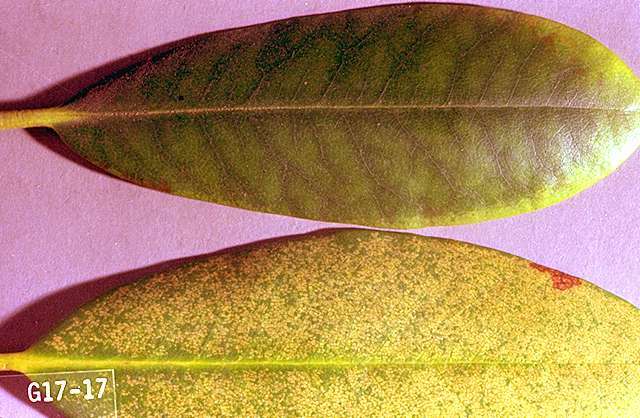 Remove leaves with brown patches of eggs along the midrib. Hosing plants with a strong stream of water directed at the underside of leaves will help to remove some adults and wingless nymphs. Resistant azalea cultivars include: 'Autumn Amethyst', 'Autumn Twist', 'Autumn Royalty', 'Autumn Sangria', 'Autumn Cheer', and 'Autumn Rouge'. In addition, some cultivars are moderately resistant: 'Autumn Embers', 'Autumn Bravo', 'Autumn Starlite', 'Autumn Ruby', and 'Autumn Princess'. Release of lacewing larvae have proven successful in one experimental test. Select insecticides to preserve populations of beneficial predators which will help control lace bugs.